Some ovarian cysts do cause symptoms such as pain, and do need to be treated. Some need to be removed by surgery. 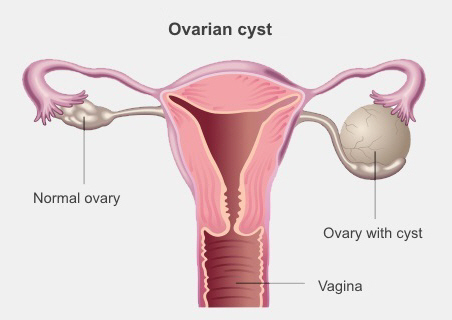 Occasionally ovarian cysts are caused by cancer, but this is rare. What types of ovarian cysts are there? There are several different types of ovarian cysts, but they all fall into two groups. Functional cysts are the most common type. These develop as part of your normal menstrual cycle. They are harmless and don't need to be treated, and will usually go away by themselves within a few months. Pathological cysts are much less common. They are caused by abnormal cells growing. They are usually not cancer. Cancerous cysts are more common in women after menopause. Some other conditions can cause ovarian cysts. For example, endometriosis can cause cysts if endometrial cells grow on your ovaries, and polycystic ovary syndrome causes lots of cysts to grow on your ovaries. How do I know if I have ovarian cysts? A lot of ovarian cysts don't cause any symptoms, and may be discovered by chance if you have an ultrasound scan for another reason. sudden, severe lower pelvic pain. If you have sudden, severe lower pelvic pain see a doctor urgently. Treatment for ovarian cysts depends on what type and size they are, and whether they are causing any symptoms. Most cysts go away by themselves. Sometimes your doctor will not treat your cyst straight away, but will monitor what happens, with repeat ultrasound scans and blood tests. Your doctor may recommend surgery, either to find out exactly what the cyst is, or to help with the symptoms. After the cyst is removed during surgery, it can then be examined under a microscope to find out what kind of cyst it is. If you need surgery, it will usually be keyhole surgery (a laparoscopy). This page answers questions such as: What are the ovaries? What are ovarian cysts? What is the treatment for ovarian cysts. Written by HealthInfo clinical advisers. Endorsed by clinical director, Obstetrics & Gynaecology, Canterbury DHB. Page created November 2016.